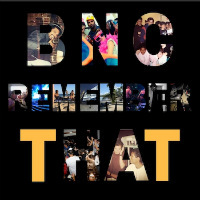 It’s been a while but MC BnC a.k.a Bruises n Cuts is back with a new drop – the Remember That EP on his label MBRD a.k.a. My Boom Raises The Dead Records. Don’t go expecting his ‘boom’ to be all fast and raucous though. No this’ll raise the dead by dint of reminding them of lazy, hazy days in the light…skateboarding at the park…staring at the blue sky…barbecues, afternoons on the beach – you know – playing football in the park, jumpers for goalposts, rush goalie…alright, I might have added the last bits. Imagine BnC regaling us with images of long-lost summers over trip-hop speed, 75bpm drums, psychedelic synth swirls and tinkling piano and you’re ballpark for the sound though. Also comes with added Blue Flamingo – another hazy, psychedelic affair that instrumentally reworks The Flamingos’ dreamy 1959 doo-wop effortI Only Have Eyes For You.